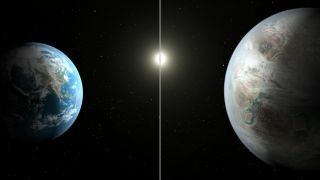 Earth, at left, shown with Kepler-452b, which receives the right amount of light to support life, new research suggests. Kepler-452b was the first exoplanet that scientists identified as being approximately Earth size and in the habitable zone of its star. With every new exoplanet discovered, the same question arises: Could this world host life? The default way scientists first approach that question is to check if the planet lies in the so-called habitable zone, the range of distances from a star in which a planet can hold liquid water on its surface. But water alone doesn't make life, so in a new paper, a team of scientists looked at another aspect of habitability: whether a planet receives enough ultraviolet radiation to create life's building blocks. Most scientists think that life began with ribonucleic acid (RNA). Like DNA, this molecule can transmit information, but unlike DNA, it can also help other molecules react with each other, potentially allowing RNA to replicate itself. But getting that RNA in the first place is tricky. This feat is so tricky, in fact, that the problem of creating RNA has haunted chemists interested in the origins of life for almost half a century, Sukrit Ranjan, a planetary scientist at the Massachusetts Institute of Technology, told Space.com. Ranjan has collaborated with the researchers in the recent study but was not involved in the new work. He said that scientists know how to create each of the three building blocks that make up a molecule of RNA. In previous work, chemists have also figured out how to piece those building blocks together into two of the four flavors of RNA by focusing on a specific tricky chemical bond first. "The thing that jumped out to planetary scientists was that this mechanism requires UV [ultraviolet] light to function," Ranjan said. So, Rimmer asked questions like what type of lights the chemists were using in their experiments and how closely those setups mimic the light produced by stars. For the new paper, Rimmer and his colleagues watched that mechanism work on two different chemical mixes meant to imitate a sulfur-rich young world and under a range of ultraviolet conditions. Those experiments let them calculate a minimum amount of ultraviolet light required for RNA formation. This was Rimmer's first time doing formal chemistry lab research, and he said he appreciated taking the new approach. "I really enjoyed that aspect, because I think that experimentation is really the way that you can ground yourself in reality," he said. "It's like observation. It's something that you can very much see." Others may not be so convinced by the new experiments: Frances Westall, an astrobiologist at the National Center for Scientific Research in France who was not involved with the study, called the paper more of an "interesting thought experiment" in an email to Space.com. She said she's particularly concerned that one of the two initial sulfur mixes the team used didn't create RNA under Earth-like conditions — and, after all, we're positive life started here somehow. Once Rimmer and his colleagues had that minimum requirement for ultraviolet light, they pored over exoplanets, selecting which worlds to include in their analysis. The researchers wanted planets that scientists are confident are rocky and so focused on planets less than 1.4 Earth radiuses in size. The scientists also wanted planets that previous studies had shown were the right distances from their sun to be able to hold liquid water on their surfaces. Then, they turned to ultraviolet radiation, calculating how much light these planets receive from their stars today. That left just one firm contender, Kepler-452b, which was discovered in 2015 and which NASA billed at the time as "the first near-Earth-size planet [identified] in the 'habitable zone' around a sun-like star." Similar calculations for yet-to-be discovered planets could help scientists prioritize where they look for life, Rimmer said. That could be particularly helpful given how expensive the necessary observations of these planets' atmospheres will be — once such work is even technologically possible. These measures will happen via instruments like the long-delayed James Webb Space Telescope. "You want to make sure you're looking at the places where you have the best chances," he said. That said, the team's ultraviolet radiation calculations are not the last word on habitability. Their analyses leave out two key factors: the impact of solar flares, which can cause dramatic fluctuations in the ultraviolet radiation the star releases, and the changes a star undergoes as it ages, becoming calmer and less active. The second factor could be particularly important, Rimmer said. That's because, right now, astronomers' best bet for finding exoplanets where they can identify life is to search around small, faint M dwarf stars — which currently produce much less light than they did when they were younger. That means that while these stars may not currently foster the conditions RNA needs to form, they may have done so long ago. And life that arose in the past could still be hiding out on the surface of planets surrounding these stars. Rimmer already has plans to build on the new research: He said he wants to use xenon lamps, which more closely mimic the ultraviolet light coming from stars, providing better estimates of where RNA formation can occur. The research is described in a paper published today (Aug. 1) in the journal Science Advances.